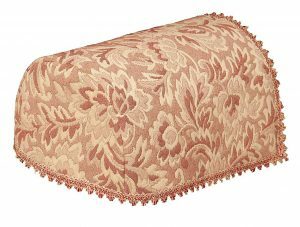 One of the most popular items we stock and probably one of the harder to find items is sofa arm covers and armchair backs. This may be because they are a somewhat traditional soft furnishing choice, however, retro is now cool and vintage is in, maybe these furniture covers don’t have to be reserved for only your nan’s house? They are an easy and relatively pocket-friendly way of changing up the look of your living room, without having to pay out for a brand new 3 piece suite. They come in a variety of different colours and designs, which means you can easily find a colour to match your living room, or you can choose a completely different design and use the chair back and chair arm covers as a nice pop of colour for your armchair or sofa. 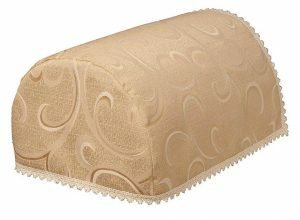 Most ranges of arm covers and chair backs come in either jumbo or mini sizes, such as this scroll design in deep beige. A standard size will fit most furniture, but for sofas with wide armrests (super comfy) we have sizes to suit in most colours and designs. This scroll armchair cover is made from 70% cotton and 30% polyester and is easy iron. Its understated design means it is easy to match with existing furniture, and also comes in other colours such as terracotta, light cream and burgundy. Furniture covers not only give your sofa a new sense of style but they can protect upholstery from everyday dirt and stains. Chair back covers can prevent dust settling on the back of your chair or sofa which after a while discolours the upholstery. The same problem can be overcome with armchair covers. How many times have you settled yourself on the couch with a nice brew, put on Gogglebox, and accidentally spilt some tea, or biscuit crumbs (chocolate digestives.. but who’s asking) and had to jump up straight away and scrub it with a damp cloth before it stains. Not your ideal Friday night. Armrest covers take away this problem entirely, just whip it off the chair and stick it in the washing machine, easy peasy. 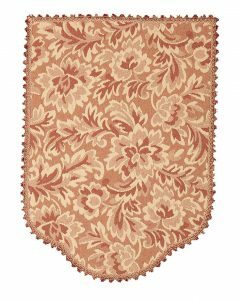 Armchair covers and chair backs come individually so you can mix and match, or we also stock sets of 5 chair back covers and 6 armrest covers in all designs. 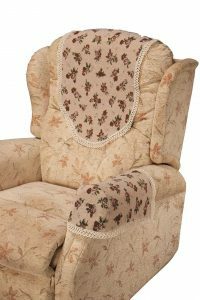 This Rosie set of 5 chair back covers and 6 armchair covers will easily give your living room a vintage country feel. Its design of a brown rose with green leaf detail on a beige background will easily match and complement most colour schemes. They are made from 55% cotton and 45% polyester, are machine washable and easy to iron. This design range also contains cushion covers and table runners. For more of a block colour floral design, the floral matelasse range in arm covers and chair back covers are an ideal style for your armchair or sofa. The pink gives a lovely pop of colour, bright and perfect for summer. This design also comes in taupe for a more neutral look, or green and cream. Even though they are made from a hard wearing polyester/cotton they will need to be hand washed as they are a very good quality fabric. Pairs of armchair covers are only £9.99 and the chair back covers are £4.99 each. Much cheaper and than a new sofa, even with the everlasting DFS sale. There are over 50 designs and colours on our website store, have a browse and if you need any help or inspiration, feel free to drop us an email and we can help you style your sofa until your heart’s content!